Until now, most casino software required us to log out of one game before we could switch to another one. 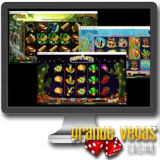 But the game developers at Realtime Gaming, which produces all of the games at Grande Vegas, have now found a way for us to keep one game open while opening a second or third. Grande Vegas Casino has just introduced the new multi-slot technology and ti celebrate they've got a 250% up to $250 Multi Slot Casino Bonus available until the end of the month. $250 deposit bonus available until the end of May.